The bamboo courtyard. Expansive. Enclosed. Inaccessible but a view into another world. Fountains projecting thin streams of water into the sky above and rounding down to meet the pebbled surface. Face and hands pressed up against the glass. Breathing. The Great Hall of wonderment. Looking up. The golden carpet reclined on. Not a floor but a viewing platform. The garden. Tarax Play Sculpture by Peter Corlett. White spheres of play. Sunken. The echo of the metal shell as the child moved within the interior and around. Little hands at times unable to grab hold of the surface. Slipping but determined to persevere. Perseverance in the pursuit of the new. In pursuit of difference. A gallery of expansion and compression. Solidity. Openness. Light, shade, darkness. 1959. A rectangular building aligned to St Kilda Road. A triangular administration building following the edge of Southbank Boulevard. The garden. A geometry born from leftoverness. The original Roy Grounds building celebrated the role of the courtyard with fifty percent of the floor area dedicated to contained external space. A gallery that celebrated the role of varying spatial relationships, experiences. A gallery of expansion and compression. Solidity. Openness. Light, shade, darkness. Established memories. The 2018 Architecture Commission provides an intervention that challenges the role of the garden. The 2018 Architecture Commission provides an intervention that acknowledges the past bringing with it a sympathetic geometry, a sympathetic language reverberating the formal architecture of Roy Grounds. Providing an embedded condition the commission defines landscape as interior. The collective memory. Distorted by the many eyes, the re-tellings. The ‘new’ formalizes a memory of a past time. Collage is used as a tool for stitching together a formal memory. A constructed memory. A memory blurred by time. A ghost of a formal language. An exercise that is not defined by elevation but rather by the perspective view. A geometry that navigates the various elements that are presented within the existing garden. A geometry that defines a spatial experience. A spatial order. Generating a new spatial memory. A spatial outcome. A new formal outcome. Re-formalizing an architectural memory of what was. As architects are we place makers or agitators of place? A landscape of engagement defining a spatial order. Defining a new experience. A new memory. By burying the architecture it is revealed. With time, disappearance. Memory. Remembered architecture. This is not about making spaces that are performative but rather spaces that are explored, passed through. Spaces that provide new spatial memories. It is about generating a landscape that can be sat on, leant on, occupied and inhabited. The inclined grassed lawn reminiscent of defined civic spaces – the State Library of Victoria defining forecourt and public occupation, engagement. Place making. 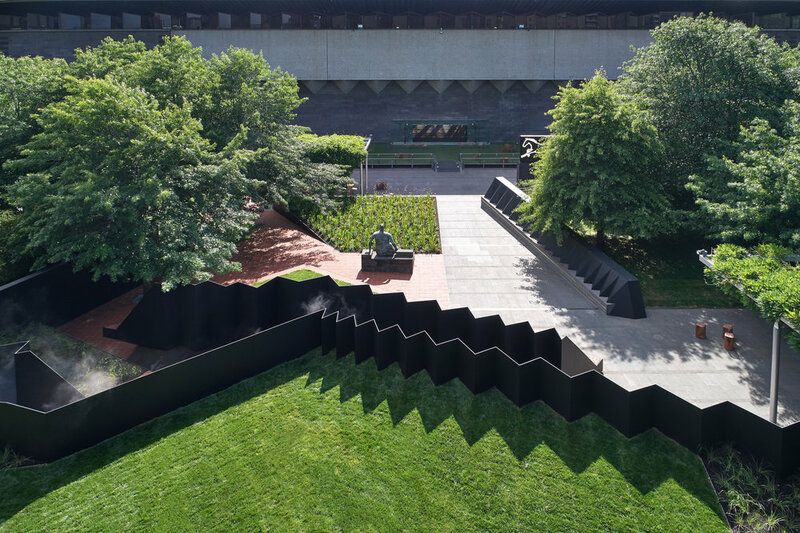 The commission provides the opportunity to engage with what the NGV Garden is and can be. It becomes an opportunity for embedding within an existing condition celebrating the garden for its formal qualities while bringing a familiar language defining a new spatial memory imbued with that of the architectural language of Roy Grounds. Spaces for the body: Room, Corridor and Field. Each wall accompanied by a fold in the topography of the garden that creates a double ground.